Additional research provided by David K. Davis and Carolyn Sparks Whittenburg. Although the war for independence from Great Britain had essentially begun, the 13 colonies had not categorically affirmed their mutual intention to establish a new country on the American continent. Beginning in September 1774, the colonies sent delegates to Philadelphia to serve in the First Continental Congress, whose purpose was to discuss Britain's oppression of the colonies, formulate a careful statement of colonial rights, apply economic pressure to the English Parliament, and forge a strong colonial union. Representatives from 30 of North Carolina's 36 counties, meeting in North Carolina's First Provincial Congress in New Bern in August 1774, had elected three delegates to represent them in Philadelphia. They were William Hooper, Joseph Hewes, and Richard Caswell. Their instructions were to examine the present state of the British colonies, describe colonists' rights, repair any infractions to those rights, and protect the colonists from future violations. The delegates were vested with authority to act on behalf of the colony. The First Continental Congress accomplished its mission with the adoption of the Declaration of Rights and Grievances to protest British trade legislation and the Continental Association plan, a nonimportation, nonconsumption, nonexportation agreement. The Congress began to unify the colonies on a permanent basis as the United Colonies. Representatives to the Second Continental Congress, convened in May 1775, did not agree on the question of independence. Whereas some delegates vehemently argued in support of total separation, others opposed cutting all ties with Britain. Hooper and Hewes continued to serve throughout the second congress along with John Penn, a Granville County lawyer who replaced Caswell when he resigned to become treasurer for the Southern District of North Carolina. Penn's election to the delegation may have been an attempt to placate those backcountry settlers who were likely to support the Crown in an armed struggle, as well as to ease east-west sectional tensions within the North Carolina Provincial Congress. Hooper and Hewes initially supported reconciliation with Britain. Fearful that separation would wreak financial and commercial turmoil, Penn also briefly endorsed a rapprochement. But as colonial relations with Britain deteriorated and King George III declared the colonies to be in rebellion, the North Carolina delegates advocated withholding their colony's naval stores from British use, strengthening the Revolution, and forming a Carolina militia. As the Continental Congress moved from reconciliation toward insurrection, North Carolina strengthened its position on independence. North Carolina's Fourth Provincial Congress, meeting in Halifax during April-May 1776, empowered its delegates to the Second Continental Congress to concur with delegates from the other colonies in declaring independence and establishing foreign alliances. This was the first official colonial action to secure independence. Although North Carolina made the first formal provincial endorsement for separation with the Halifax Resolves of April 1776, Hewes waited to present the resolves until 27 May, the same day the Virginia delegates presented their resolves. On 2 July the congress adopted the motion by Virginian Richard Henry Lee to make the colonies free and independent states. On 4 July 1776 the Second Continental Congress approved the final draft of the Declaration of Independence. Hooper, Hewes, and Penn all signed the historic document. By the time it adjourned in December 1776, the congress had voted for independence and had begun the transformation of the 13 American colonies into a national government. 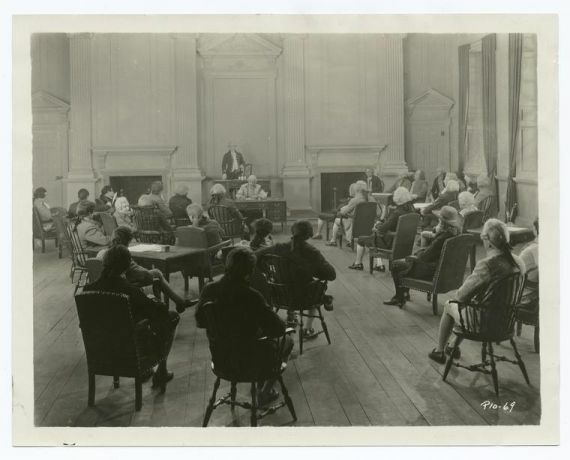 "A Session of the Second Continental Congress". Courtesy of the New York Public Library Digital Gallery, Image ID: 93368 . Available from http://digitalgallery.nypl.org/nypldigital/dgkeysearchdetail.cfm?strucID=132110&imageID=93368&k=0&print=small (accessed May 10, 2012).